Linen bedding is the best of the best when it comes to sleeping cooler in the summer. It's breathable fabric creates ventilation to keep the body cool at night in the hotter months and insulates to keep you warm in the winter. Linen's moisture-absorbing qualities prevent bacteria from growing, which also means they won't stick to your body like cotton sheets do. Plus, they actually get softer each time you wash them and are eco-friendly, too! 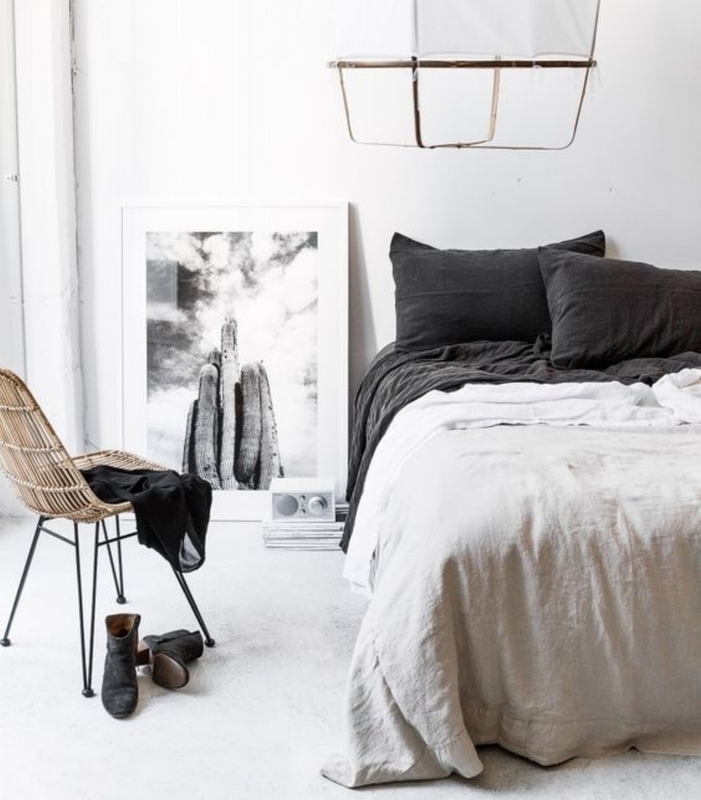 Like linen bedding, coverlets and blankets are another great warm-weather bedding option and are perfect for when you want more than a sheet but don't want the heaviness of a comforter or duvet. Available in different weaves for warmth or air flow, they can also serve as a way to add texture, pattern and color to your room. We even love the idea of light layers; using a coverlet in place of a duvet and a lightweight blanket folded lengthwise at the bottom of the bed. We've been crushin' hard on these beauties or a long time now. They are so versatile when it comes to style, and can be found in soft neutrals or a fun range of colors and patterns. One of our favorites, Coyuchi, makes theirs plush and lightweight (perfect for those hot Summer months) with 100% organic cotton grown and woven in Turkey. Like the clean and tailored look? 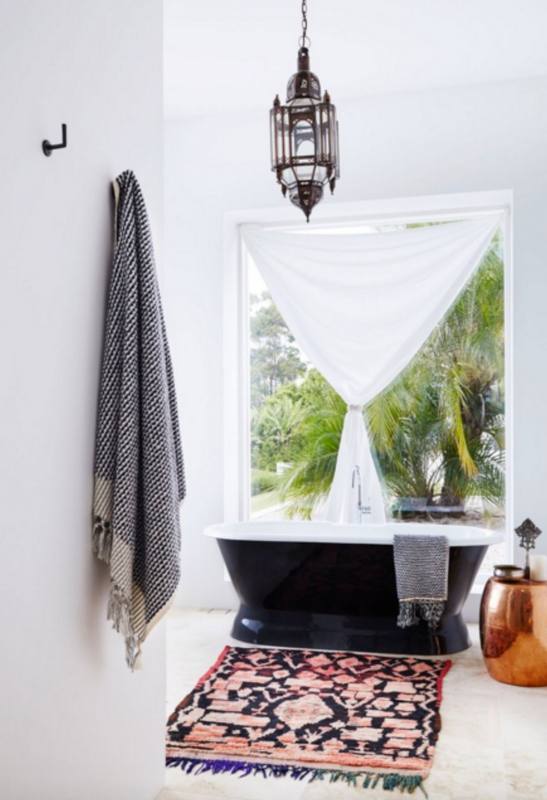 Hang them neatly on a bar or over a beautiful tub, and if you like that easy-breezy boho look, drape them from the center of an iron hook to showcase the tassels or fringe. You'll probably love them so much, you'll keep them year round. Just saying. Trade in the heat and the flame of candles for a light, refreshing diffuser. Made with essential oils, reed diffusers are a great accessory in your small space or bathroom. Not only are the bottles beautiful to look at, but they give a long-lasting continuous fragrance with zero maintenance. The scent will remain as long as the oils do, which can last as long as 6-8 months. We like to keep things fresh in the summer with scents that include citrus, eucalyptus, basil, bergamot, amber or vetiver. These gorgeous 3-pronged, modern fans don't just keep you cool but can also work to highlight A-frame or extra high ceilings, creating a bit of drama. They are sleek, beautiful and super functional with 3 speeds, wall-control features, and most have a larger blade span than your average ceiling fan, which will keep you cooler in a larger space. These guys prove that form and function are just better together. There's nothing we look forward to more than a good outdoor summer dinner party. Good food, friends, music, and cool refreshing drinks. What else do you need? These pretty pitchers are giving us some major inspiration right about now, and whether you like them to be mixed with booze (raises hand) or not, a beverage station with seasonal fruits and herbs is a must-have at your next gathering. Now that you have your refreshments, relax under some much needed shade with a large patio umbrella. Create an outdoor oasis by laying down a jute or outdoor rug, grab your favorite chairs and a bench, a surface to set your drinks on and a few all-weather pillows. Finish the look off with a couple medium-sized plants, string lights and candles, and you'll have the best and coolest hangout spot all summer long.